1. There are four basic species of hyenas. They are the Striped hyena, Brown hyena, Spotted hyena and the Aardwolf. The last three are found in various parts of Africa while the Striped hyena is found in Africa and Asia. 2. When they are excited, hyenas make a sound that resembles high-pitched laughter. That is how the expression “laughing hyena” came about. 3. 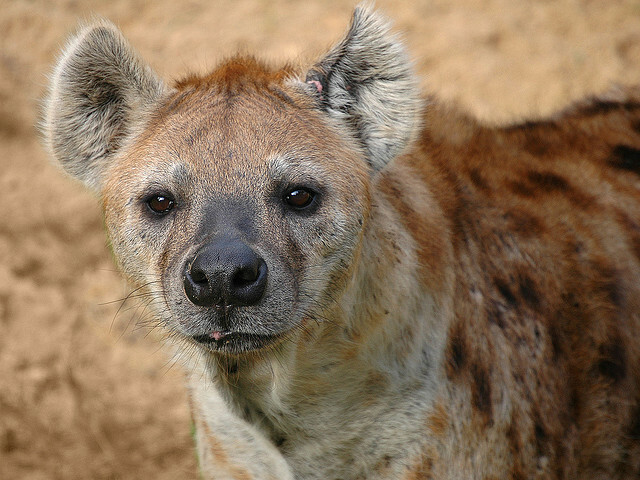 Most hyenas are carnivores, meaning they mostly eat meat for survival. They are known to hunt zebras, buffaloes, and antelopes as their prey. The aardwolf species of hyena, however, lives on a diet that consists mostly of termites and other larvae of insects. 4. Hyenas spend much of their time living in groups, which are called “clans.” These groups can range from 5 to 80 hyenas. 5. A baby hyena is called a cub. Most litters result in the birth of 2 to 4 cubs. 6. The main predator of hyenas is humans, but lions and hunting dogs also prey on hyenas. 7. Hyenas share similar characteristics with both canines and felines. Like the canine, they chase their prey and grab it with their mouth instead of their paws. But much like the feline, they often clean themselves with their tongue and mark their territory with their urine scent. 8. Female hyenas are generally the tougher of the two sexes. They have more testosterone than the male hyenas, they have more muscles, and they are about 30% bigger than their male counterparts. 9. The jaws and teeth of the hyena are so strong and powerful that they will eat every part of an animal carcass, including its bones. Because they often eat the bones, their waste is generally an off-white color. 10. For many years, hyenas were believed to be hermaphrodites, which means that they contain the reproductive organs of both sexes. This is because the female’s genitalia is very similar to that of the male’s genitalia. But further study has revealed the minor differences between the two reproductive systems. 11. When hyenas are playing or snuggling, they make a calm sound that expresses their joy. 12. Hyenas have very strong hearts. This allows them to run at full speed for several miles at a time without getting exhausted. 13. Hyenas thrive in places like the grasslands, forests, savannas and woodlands. They enjoy higher altitudes and they usually make their dens on top of high rocks and mountainsides. Their dens are often connected through a system of underground tunnels which helps them travel about safely. 14. Fully grown male hyenas can weigh between 100 and 140 pounds whereas adult female hyenas weight between 120 and 165 pounds on average. 15. The gestation period for hyenas is about three months. 16. Hyena cubs can begin eating meat at about five months old. However, they usually tend to suckle from their mother for the first 12 to 18 months of their life. 17. A hyena’s lifespan when living in the wild is generally between 20 and 25 years. In captivity, they have been recorded to live as long as 40 years. Striped hyenas have a much shorter average lifespan when living in the wild. Due to predators, they often do not survive longer than 12 years. 18. Spotted hyenas can eat as much as a third of their body weight in one single feeding. 19. When hunting prey, hyenas rarely kill an animal right away. Instead, they generally like to tire out the animal until it gets exhausted and then they begin eating it before it is even dead. 20. Female hyenas do not mate with other hyenas within their clan. They usually find a wandering hyena to mate with. 21. The aardwolf is the smallest species of hyena. It stands between 15 and 20 inches tall at the shoulders and only weighs between 50 and 60 pounds when it is fully grown. 22. In full sprint, hyenas can reach speeds of 35 miles per hour. 23. Hyenas are generally cowardly animals. When threatened by other animals, they rarely fight and often just run away. 24. The cubs of the spotted hyena will attack and kill their own siblings from time to time. 25. Hyena cubs can go a week in between feedings because their mother’s milk, which has a fat content of 14% and a protein content of 15%, is enough to keep them full and satisfied for several days.